I recently started playing this game; in the last couple of weeks in fact, and so far, I've been enjoying it greatly. That being said, however, I am also something of an anorak in railfan terms, particularly in my specialty subject of British steam traction, which does mean that two particular machines in Era 2 rub me the wrong way. 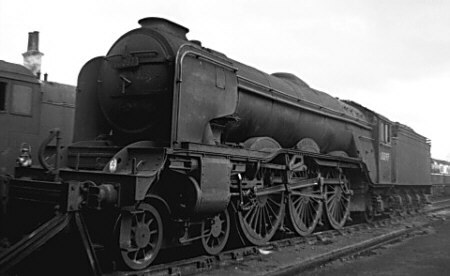 These specific units are the "Bat", whose default skin is based on the LNER Class A1/A3 Pacifics, specifically the Flying Scotsman in LNER livery as 4472, widely considered to be the most famous steam locomotive in the world; and one of the unlockable skins for the "Boar", which turns the engine into a representation of No. 4468 Mallard, one of the LNER's Class A4 Pacifics, and holder of the world's speed record for steam rail traction. My gripes with these engines can be easily summarised by this; firstly, the two Flying Scotsman skins for the Bat are both inaccurate- the default skin shows her as she commonly runs in preservation; in LNER Doncaster Green, as she would have looked between 1923 and 1939, but her mechanical condition is that of her appearance between 1959 and 1963, when under British Railways ownership as no. 60103, she ran with double chimney and German-style "Bat wing" smoke deflectors, and in a livery of "BR Lined Passenger Green" (similar to Brunswick Green) with the post-1957 "British Railways" heraldic device on the tender- this would also be a good choice for the unlockable version of the Flying Scotsman skin for the Bat. The A4 skin for the "Boar" on the other hand, is very close to looking correct, but with the 'wedge' nose is stretched too far forwards, the number is incorrect (4175 was not assigned to any LNER locomotive of the pre-WWII era, that I can find), and similarly, the tender should also spell out LNER on the side. You most certainly are a superfan railfan. I can understand you annoyance at the mismatched pats/colors form differing time periods on the Flying Scotsman, and I am willing to bet the artists were looking at multiple photos from multiple eras and not realizing it. This is an awesome catch IMO! As for the Boar skin, I think the minor paint differences are probably necessary. There are probably some licensing and/or copyright laws that they are trying to abide, because if you look at all the production series ("skins") it is common on all of them. The post was edited 1 time, last by Nerisrath: minor spelling corrections, originally left out grey coloring ( Oct 11th 2018 ). I personally feel that this design of smoke deflector is much more attractive than the "Bat Wings" that the rest of the A3's were fitted out with in BR days. Railnation should add skins/production series for bonus trains and passanger trains. for example the dutch ''hondekop'' (witch is a passanger train avaible in era 5) should besides its green variant also have the yellow/blue variant. also why aren't any Belgium trains?